Even though we are a year away from REAL IDs being available in Pennsylvania, it's important for customers interested in a REAL ID to start preparing now. And to help, PennDOT has opened online application for REAL ID pre-verification to customers who received their first Pennsylvania driver's license or ID after September 2003. 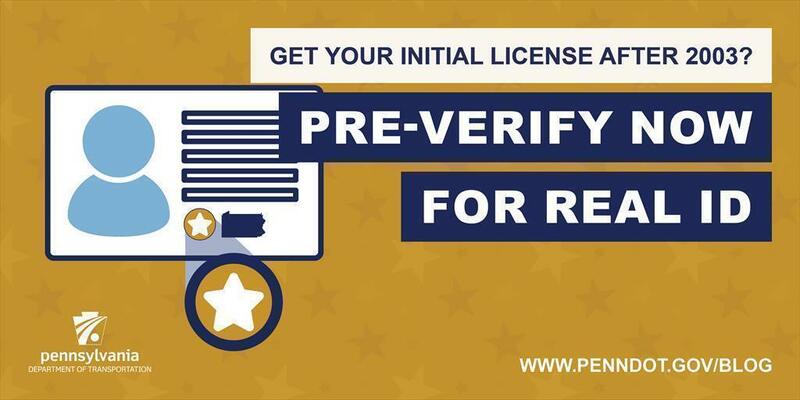 It's simple — visit www.PennDOT.gov/REALID and click the "Pre-Verification" button. You will be asked for your license or ID number, date of birth, and the last four digits of your Social Security number. Once you have completed the pre-verification application process, PennDOT staff will review your record and verify which documents are on file. You will receive follow-up communication from PennDOT regarding the status of your application. It's important to note, though, that customers are not officially pre-verified until they have completed the online process and received confirmation from PennDOT that all documents are on file. So, why only customers who received their initial product after September 2003? That's when PennDOT began imaging copies of customers' identifying documents as part of its initial driver's license or photo ID issuance process. Scanned versions of those documents were included in those customers' driving records. If PennDOT has your records on file, you can be pre-verified and order a REAL ID in spring 2019 as soon as they are available. You will not have to visit a driver's license center. If PennDOT does not have your records, or you received your initial product before September 2003, you'll need to provide a series of documents to apply for a REAL ID product, per federal regulations. Those documents include proof of identity, Social Security number, all legal name changes, and current, physical PA address. Visit PennDOT's REAL ID Document Check page for full information. Remember, REAL ID is optional for Pennsylvania residents. A federally-accepted form of identification (whether it's the forthcoming Pennsylvania REAL ID driver's license or ID card, a U.S. Passport/Passport Card, a military ID, etc.) must be used as identification to board a commercial flight or visit a secure federal building on and after October 1, 2020. Not sure if you'll need a REAL ID? Answer a few questions on our website to help you decide. If you still have questions on REAL ID in Pennsylvania, visit our REAL ID FAQ page. And be sure to check back regularly for updates, or follow us on social media — Facebook, Twitter, and Instagram​.